Mega Cherry Tomatoes - made for TALL GARDENS! 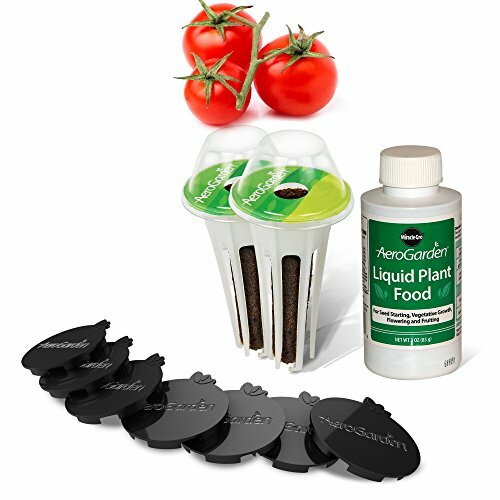 The Mega Cherry Tomato Seed Pod Kit for TALL AeroGardens (EXTRA,ULTRA, Bounty & Bounty Elite models) comes with everything you'll need to grow these fresh tomatoes and we've carefully selected varieties proven to produce. These TALL vegetable plants require more growing space and best results are achieved when no more than two Seed Pods are planted in a TALL, 9 Pod garden; this Kit contains two (2) Seed Pods and seven (7) Plant Spacers so your tomato plants have ample room to grow and thrive without overcrowding. Highly productive, fast growing plants produce for 7 months or more and produce mega yields of delicious, large cherry tomatoes. These fast growing varieties are specially chosen and produce lots of great tasting cherry tomatoes in your AeroGarden, any time of year! For use in Tall (24" Grow Height - Extra/Ultra/Bounty models) AeroGardens. Please note that product packaging may classify plant spacers as part of product's total seed pod count.